Superfoods have indeed taken the Western world by storm. Almost every month a new product hits the shelves that claims to increase your energy, boost your immune system, offer you increased longevity or supply you with a days worth of nutrients in a single serve. I am not immune to these tempting products and my shelves at home are indeed lined with bottles, jars, tins and containers with various colored powders or liquids that are synergistically combined in my morning smoothies! The abundance of cacao, maca, acai, spirulina and chia seeds is on one hand very exciting as more and more healthier alternatives are making their way into mainstream society. On the other hand, these superfoods have eclipsed our love of simple foods that also offer wonderful health and healing properties. Lets take a look at some of the ‘traditional’ superfoods and how we can utilize them in the kitchen in easy and delicious ways. Cauliflower is a member of the cruciferous family of vegetables and contains an impressive array of nutrients, including vitamins, minerals, antioxidants and other phytochemicals. Cauliflower contains a wealth of anti-inflammatory nutrients to help keep inflammation in check. It is also an important source of dietary fiber for digestive health and can help protect the lining of the stomach and prevent bacterial overgrowth. Cauliflower is a good source of choline- a B vitamin known for its role in brain development. Choline helps to boost cognitive function and improve learning and memory. Eating cauliflower regularly is a simple way to get essential nutrients into the body. One serving of cauliflower contains 77% of the recommended daily value of vitamin C and it is also a good source of vitamin K, protein, thiamin, riboflavin, niacin, magnesium, phosphorus, fibre, vitamin B6, folate, pantothenic acid, potassium, and manganese. Cauliflower is also packed with antioxidants including beta-carotene, kaempferol, quercetin, rutin, cinnamic acid and more. These micronutrients help the body combat the daily effects from pollutants outside the body and also stress and infection within the body. Cauliflower also activates detoxification enzymes that assist the body to rid itself of waste matter. Cauliflower is extremely versatile and can be eaten cooked or raw. It is wonderful blended in soups, added to stirfrys or curries, processed to form a raw rice or healthy version of mashed potato and blanched and added to salads. Turmeric is loaded with many healthy nutrients such as protein, dietary fiber, niacin, Vitamin C, Vitamin E, Vitamin K, potassium, calcium, copper, iron, magnesium and zinc. Due to all these factors, turmeric is often used to treat a wide variety of health ailments. Researchers believe that turmeric’s unique antioxidant and anti-inflammatory properties may be strong enough to break down the plaques in the brain that contribute to Alzheimer’s disease. Turmeric is also often touted as having the power to inhibit the growth of tumors and therefore be beneficial in treating and preventing breast, skin and pancreatic cancer, childhood leukaemia and multiple myeloma. Turmeric also has a positive effect on cholesterol, helping to lower cholesterol levels and prevent the build-up of “bad” cholesterol that can block arteries and cause heart attacks and strokes. It may also be helpful in weight loss as Turmeric stimulates the gallbladder and produces bile. Bile helps to digest fat which also results in improved digestion and a reduction in bloating and gas. 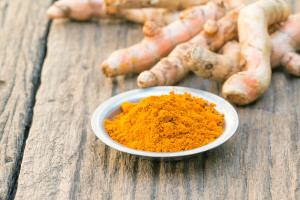 Turmeric’s natural anti-inflammatory qualities mean that it can be as effective as some anti-inflammatory medications, without the side effects. The anti-inflammatory properties have shown to be beneficial in treating both osteoarthritis and rheumatoid arthritis, offering relief from joint pain and inflammation. Try adding fresh turmeric to curries, soups, stews or even salad dressings. It is wonderful taken as a tea in the morning- simply slice turmeric up and add 4-5 slices to boiling water. You can also add chopped up ginger, honey and lemon for a real immune boosting tea! One medium sweet potato will provide well over 100% of your daily needs for Vitamin A, as well as 37% of vitamin C, 16% of vitamin B-6, 10% of pantothenic acid, 15% of potassium and 28% of manganese. Sweet potatoes also have small amounts of calcium, iron, magnesium, phosphorus, zinc, vitamin E, thiamin, riboflavin and folate. Sweet potatoes are a great source of beta-carotene, a powerful antioxidant known to give orange vegetables and fruits their vibrant color, which is converted to vitamin A in the body. Consuming foods rich in beta-carotene may reduce the risk of developing certain types of cancer, offer protection against asthma and heart disease and delay aging and degeneration. Although they are sweet by nature, sweet potatoes are considered low on the glycemic index scale and their natural sugars are slowly released into the bloodstream, helping to ensure a balanced and regular source of energy, without the blood sugar spikes linked to fatigue and weight gain. When your sweet potatoes are organic, keep the skin on! The skin contributes significant amounts of fiber, potassium and quercetin. Sweet potatoes are very versatile. Try them roasted, puréed, steamed, baked, or grilled. You can add them to soups and stews, or grill and place on top of leafy greens for a delicious salad. You can also puree them and add to smoothies and baked desserts. 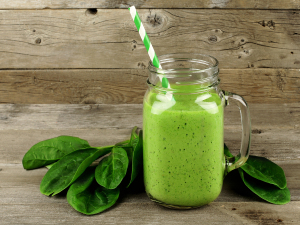 You need not spend a fortune on the latest fad superfoods, there are many ‘every day’ foods that still have superior healing qualities and properties. Does Your Body Need A Spring Clean?